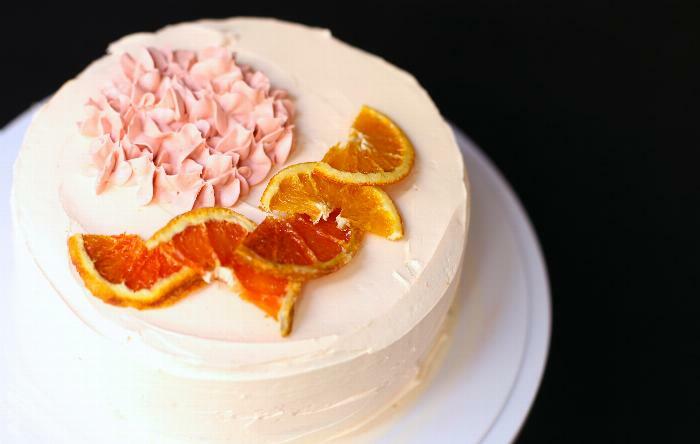 This Cara Cara Cake was inspired by the vibrant citrus season in Southern California. It is a delicious white cake with the flavors of Cara Cara Oranges. It is easy to whip up and makes for a beautiful presentation. 1CAKE: Preheat the oven to 350°F. Sift together the flour, baking powder, and salt. Grease two 9×1-1/2-inch cake pans and line the bottoms with parchment paper. Lightly flour the sides and bottoms of pans. 2Using an electric mixer, cream together the butter and zest. Gradually add sugar, mixing until light and fluffy. Scrape down the sides of the bowl. 3Add eggs, one at a time, mixing well between each one and scraping down the sides. 4Slowly add the dry ingredients and orange juice to the sugar and butter mixture, beating on low speed after each addition. 5Pour equal amounts of the batter into the two cake pans. 6Tap the pans on the counter before putting them in the oven to even the batter. 7Bake for about 30 minutes, checking with a toothpick to see if it comes out clean. 8Let the cakes cool in the pans for 10 min. and then loosen the caked by running a knife between the cake and edge of the pan. Remove the cakes from the pans and continue to cool them on a rack. 9FROSTING: In a large mixing bowl, cream the butter until it is smooth. 10Add the confectioners’ sugar in scoops one at a time and combine thoroughly. 11Add the orange extract and food coloring and mix until well blended and desired color has been reached. 12If you would like to work with multiple frosting colors for layers and decorating, scoop desired amount into smaller bowl and adjust color as desired. *For my cake, I made the filling frosting and decorating frosting different shades of pink. 13DRIED ORANGE SLICES: Preheat oven to 200 degrees. 14Line a baking sheet with parchment paper. Place orange slices in a single layer and dust with plenty of sugar. 15Bake for about 2 hours and 30 minutes — until the peels are dry and the flesh is translucent. *Can be made ahead of time. 16When the cakes are thoroughly cool, place one on a cake stand, or flat plate. 17Spread a layer of frosting on top of cake, this is your bottom layer. Make sure the frosting is smooth and even. Amount of thickness is up to you. 18Place second cake on top of frosting layer. 19Continue to spread frosting over cake layers as desired. It really helps to have a spinning cake stand to really get your frosting smooth and even! 20Arrange dried orange slices on top in any pattern you wish. 21For additional decorations, place frosting of a different color in a piping bag and design.